The SinnoTest® is the result of Pr Philippe Gaudin and Pr Athan Baillet academic research work, within the GREPI laboratory of University Grenoble Alpes UGA. The Sinnovial start-up was created to accelerate the technology development, through pooling of necessary skills required for placing this medical device on the market. Philippe Gaudin is University Professor – Hospital Practitioner in Rheumatology at the University Hospital of Grenoble Alpes, a specialist in inflammatory rheumatism in the «Pôle Appareil Locomoteur, Chirurgie Réparatrice et Organes des Sens» (PALCROS). 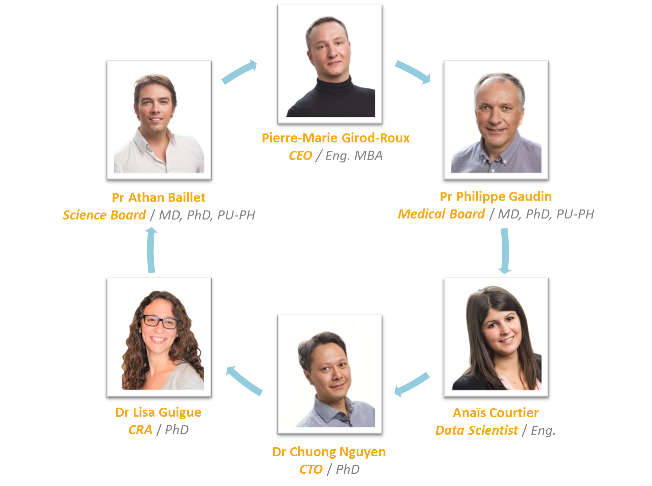 Pr Gaudin also holds a PhD in biology (molecular biology and virology) and is the director of the GREPI laboratory of University Grenoble Alpes (biomarkers and proteins involved in the inflammatory process). Since 1989, he has been teaching Rheumatology to students of the Faculty of Medicine of Grenoble Alpes. As an internationally recognized expert, he participates in defining the medical strategy of Sinnovial company and coordinates relations with the pharmaceutical industry. Athan Baillet is also University Professor – Hospital Practitioner in Rheumatology at the University Hospital of Grenoble Alpes, a specialist in inflammatory rheumatism in the «Pôle Appareil Locomoteur, Chirurgie Réparatrice et Organes des Sens» (PALCROS). Pr Baillet also holds a PhD in biology and is researcher in the GREPI laboratory of University Grenoble Alpes. Since 2012, he has been teaching Rheumatology to students of the Faculty of Medicine of Grenoble Alpes. He puts his expertise in scientific development and clinical study design to serve Sinnovial company. Lisa Guigue holds an engineering degree from the Institut Supérieur des Biosciences (Paris, 2013). Then, she embarked on a thesis (CIFRE, 2015) ; during these three years, the interaction between the hospital and applied research was central to her mission. She has applied her specialized knowledge to design and supervise R&D projects. At Sinnovial, Lisa’s mission is to coordinate the smooth running of clinical studies and regulatory follow-up of SinnoTest®. Chuong Nguyen has followed a cell and molecular biology training and completed his thesis work in sciences at the GREPI laboratory at University Grenoble Alpes. He then spent his scientific career at the international level in the USA in the laboratory of Dr Ballas (Stony Brook University, NY) and in Luxembourg in the laboratory of Pr Tschirhart (University of Luxembourg) before returning to France. His scientific expertise covers variety of areas ranging from neurosciences, phenomena linked to inflammation, oxidative stress and production of recombinant proteins. Chuong is the Chief Technical Officer of the start-up; he is in charge of organizing, planning and managing the company’s overall technical achievements. Anaïs Courtier holds an engineer degree in information technology for health. She also completed a two-year course diploma specialized in statistics and business intelligence. Anaïs worked for five years in the bio-analysis and statistics department of a biotechnology start-up. Anaïs is the data-scientist of the start-up; she deals with information technology tools, including algorithms. Pierre-Marie Girod-Roux holds a biology master and a postgraduate degree respectively in electrophysiology specialty and in management of technology companies. Passionate about entrepreneurship, he created his first biotechnological start-up (diabetology) at 23 years old. Pierre-Marie is the Chief Executive Officer of the start-up; he mainly deals with contractual, financial and administrative aspects of the company.